So we are coming to the end of this moving tale of school life and cultural indoctrination. It brings a tear to my eye to see all these little brats all grown up and ready to be inflicted on society. In a small segue, I was quite excited that seven Blyton manuscripts were bought this week by Newcastle Library to prevent them going into private hands. One of them was this book! Book six I will call “Attack of the Nouveau Riche”. I promised you that I would show you what happened when the ‘wrong sort’ were allowed into the Facility, and I shall deliver ... in the next post. I’ve split this up for a reason. I loathe this book. It’s badly put together, disjointed and confused. The side-stories that I’ve excised and given their own post are really just put in so that something happens in the story – whenever something bad happens, Darrell just “Oh that’s just too bad, but I won’t let it spoil my last term, so I’ll just forget about it ... la la-la la-la ...”. Of course, she does this with the Gwendoline story, but Gwen is the true hero of the story, so I’m not putting her in a corner. As far as Darrell is concerned, you can basically ignore her for most of the book – Enid does. She’s now Head-Girl of the school, and well on her way to adult bovinity (it’s something that I have noticed. All the teachers and grown-ups seem to be extremely stupid. They are always surprised and always at a loss to figure out how the younger kids manage their ‘ingenious’ tricks. It’s almost as if their brain switches off after a certain age … actually, that’s it! It’s always annoyed me that the end of Enid’s school series seem to imply that life is over … and maybe it is. Children get sent to school to be ‘educated’ and once the indoctrination is complete they are sent out into the world as drones, placid, unimaginative and completely devoid of that spark of individuality that defined them as children. The fire dies out, and they live out their lives with only the pilot light on … look at me getting all poetical.). Anyway, She’s being driven to school for the last time and is quite miserable over the whole process. As the reader, you get drawn into this fit of nostalgia. I read it again waiting for Hedwig to be killed (if I just spoilered HP for you, too bad. It’s been out for years now, and I can’t pander to those who are waiting for the movie. And yes, that is a message to my sisters who complained about me spoilering Anna Karenina for them), thinking again that this was one of the true parallels between the two grand dames. Nostalgia at the beginning of a last book is just self-indulgent. So, Darrell’s boring, and all of the sixth-formers are disposed of in the first few chapters. Mary-Lou is going to become a children’s nurse (and marry a doctor – Oh I can see it a mile away! ), Alicia, Sally and Darrell are off to St Andrews University (cough findahusband cough), Bill and Clarissa have bought a stable and are going to start a riding school (did you notice the part where they BOUGHT a farm? No talk of a husband … but two girls living together is apparently quite acceptable), Maureen is going to become a secretary (pleb), Irene and Belinda are off to Guildhall to be all arty and stuff, and Gwendoline – well she’s apparently off to finishing school (but more on that soon). So we can forget the oldies. They’re all very maudlin about leaving school and this being the last time that they will do this and do that … GAH! And Gwen? Well, Gwen comes into her own. This really is the basis for my absolute love of this character. Forget about the sympathy you have for the bullied misfit, Gwen gains depth at the end of this series – depth that is really quite beyond Enid, and possibly depth that wasn’t intended by the author – but depth nonetheless. Enid is at her vicious best at the beginning of the book. Gwen keeps telling everyone about a fight she’d had with her dad over finishing school. He wanted her to get a job, and she thought that was too plebeian and wanted to follow her mother’s plan of going to finishing school. Gwen’s dad really doesn’t hasn’t done himself any favours in the past be being such an absentee father and leaving her with her mother (and that governess who is having it off with either [or both] Gwen’s mother or father, because why else would she still be in the house when Gwen is 18? ), because when intimations are made that he is ill, Gwen brushes it off as being a claim similar to her own or her mother’s claims of illness (and we all know Gwen’s track record). Towards the end of the book, disaster strikes. Gwen’s father is struck down with some mystery illness – one so bad that he may die. Gwen rushes home, convinced she’s missed her chance to make it up to him. It’s here where Gwen really comes into her own. After a couple of weeks (the next chapter really) She writes a letter to Darrell, letting her know that her dad survived, but will be an invalid for the rest of his life. Unaccountably, this means that all their money is gone too – but you know, karma and all. So Gwen looks like she’ll have to financially support her family from now on … and she’s calmly accepted it and is ready to do so. She ends the letter by asking the girls to keep in touch. Darrell’s response is sickening. 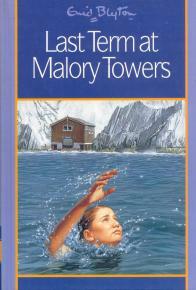 She’s happy that Malory Towers has rubbed off on her and writes back out of pity. Pity? WTF? Gwendoline just showed that she is ten times the person that any of the others there, and they PITY her? What proper adversity have THEY suffered? What also sickens me is Enid’s attribution of influence to the school, by having Grayling wisely say that this adversity ‘could be the making of her’. That this proves true does not mean that the credit goes to the school. Gwen’s spent her whole school career being bullied, isolated, put down and used, and when push comes to shove, she doesn’t back down This letter is really why I am a Gwen fan. But Enid is happy with the sappy, poor Gwendoline end. The story winds up after this. Nostalgia comes back with a vengeance. A last this, a final that. In the last pages, Sally and Darrell and Alicia have a moving scene where they ‘pass the torch’ to Felicity and June (I kid you not – they use that phraseology – carry the torch, hold the standard ... Almost warlike in its tone). It’s quite a frightening moment: yes we do want the grand traditions of brainwashing, bullying and classism carried on from generation to generation. Well done Enid! GAH! I could talk about this all week, but I’ll stop. There’s more to come – basically the side stories. And the nouveau riche ... never forget the nouveau riche! I had completely forgotten this book until now. Now that I remember it, I remember how much I disliked it. "Our" girls are so boring. Since I was an adult when I read it, a couple of things stood out. One was, of course, the wink-wink-nudge-nudge of Bill and Clarissa's Brokeback Riding Stable. And that governess of Gwen's! Gwen's nearly twenty and at school for 10 months of the year. I wanted that governess job. Unless, as you say, it involved sleeping with the boss. And finally, what Head of any school anywhere suggests that leaving school to stay home and work is best plan for anyone! Speaking as a teacher, we knock ourselves out convincing everyone that the more education they get, the better they'll be. As much at St. Clarie's frustrated me by ending in the Fifth Year, at least we were spared the awkward "wrapping up" of the series. It just kind of petered out. I've always had questions about Gwen's leaving school so suddenly. Surely her parents would have paid her fees till the end of the term so it would be cheaper to keep her on at school. And wouldn't it be better for her to finish her education and get her year 12 certificate? Was the mother going to go out to work or was she to be the full time carer of the father. As for Bill and Clara wouldn't they need some training in how to run even a small business? Where did the money come from? I wish I'd have that much when I left school!! It sounds as though we'd be better off reading your post about the book than the actual book itself. Surely this final book would have been the perfect opportunity to show how the characters have developed and to pave the way for some truly ingenious pranks as they re-live their days as first-formers (or whatever). But no. Instead it's a preparation for the mundanity of life as a Responsible Adult. Looking forward to hearing about the side stories (and the nouveau riche, of course). Mary and Margaret - I wanted Gwen to come back too. Her staying away just perpetuates the whole 'never finishing' thing that seems to surround her. The book does mention that she isn't going for the Higher Certificate (even without her dad's illness. I would have loved to have seen her come back and really work at it and come out with good marks. I really enjoy your reviews! Part of me is ashamed that I was reading Enid at seven and am still reading her at thirty. Are you going to tackle the St Clare's books? I love how, in modern editions, they've changed Carlotta threatening Angela with a spanking to threatening her with a scolding. I dont think the book is bad at all.It is written on the site that its not a good book but that does not mean its true. How lovely to revisit the 'blustering' adventures of 'Cheeky Charlie'...unforgettable for all the wrong reasons! I recall inwardly cringing as an eight-year old desperate for something to read, and having purloined my sister's MT books, well, I never looked back! Though my firm favourite will always be the original version of the "Circus of Adventure", where it was proclaimed that 'foreigners simply don't have the same sense of honour as British people...'. Long may our lady live on! Yes, and the point of these posts is to revisit the book as an adult to see how my perception has changed. It doesn't stop the love, just tempers it with a bit of perspective.